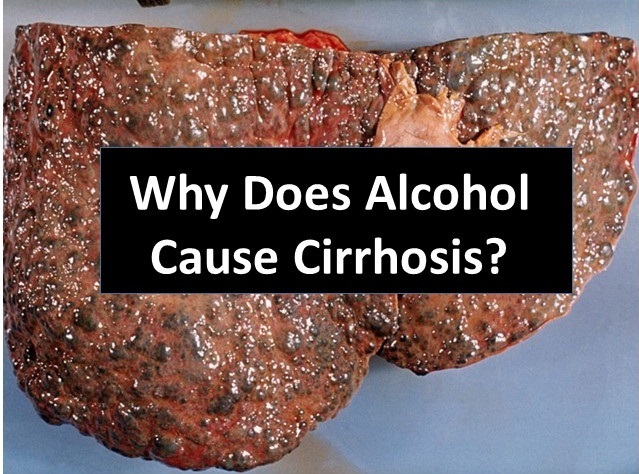 Why Does Alcohol Cause Cirrhosis? Even if one does not die from alcohol intoxication in a single large dose, it can still kill from smaller doses over a long period of time. One of the most insidious aspects of alcohol abuse is the fact that it will allow a user to continue, sometimes for decades, while it slowly destroys their body. Unfortunately, by the time they stop, it is often too late to repair the bodily damage. Long-term alcohol abuse can lead to a wide variety of diseases including cirrhosis, cancer, diabetes, and dementia. Our bodies are actually designed to handle limited amounts of alcohol. Small amounts are produced by our bodies as part of our metabolism, and alcohol can be generated during the processing of certain bodily compounds. Human metabolism includes enzymes that can convert alcohol into harmless metabolites through three basic steps. First, an enzyme called alcohol dehydrogenase (ADH) acts as a catalyst for the conversion of alcohol to the toxic intermediate acetaldehyde. The second step uses the enzyme mitochondrial aldehyde dehydrogenase (ALDH), to catalyze the conversion of acetaldehyde to acetic acid. Finally, the third step involves acetic acid being broken down into water and carbon dioxide through a series of reactions involving the citric acid cycle (CAC). Problems occur when these mechanisms become overwhelmed due to excessive alcohol consumption, resulting in acetaldehyde beginning to accumulate in the liver. Acetaldehyde is known to be toxic, carcinogenic, and the source of much of the long-term damage caused by alcohol. Acetaldehyde easily reacts with certain nitrogen-containing groups call amines, which can be found in the amino acids that make up proteins, to form what are called adducts. The formation of an adduct changes the structure and therefore the functionality of these proteins. In the case of protein adducts, the structure changes to the point where our own bodies see them as foreign invaders and mount an immune response, causing liver inflammation. Proteins make up enzymes, which are critical to the survival of cells. After adduct formation, these enzymes no longer function properly, and the cells die. Our bodies have processes that can repair or replace damaged proteins, but if enough build up they can lead to cirrhosis, liver failure, and death. Alcohol accounts for 28% of all liver-disease-related deaths in the U.S., and is also responsible for a little over 3% of all cancer deaths that occur globally. Hepatocellular carcinoma (liver cancer) is the fifth most common type of cancer, with an estimated 500,000 new cases being diagnosed every year worldwide. Because this type of cancer is usually discovered late, the prognosis is poor, with a median survival time of 1-2 months. My book has tons more just like it! © Strange Chemistry, 2012. Unauthorized use and/or duplication of this material without express and written permission from this blog’s author and/or owner is strictly prohibited. Excerpts and links may be used, provided that full and clear credit is given to Strange Chemistry with appropriate and specific direction to the original content.